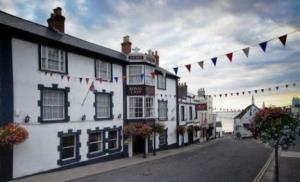 The Royal Lion Hotel01297 445622work01297 445859fax HotelSet within Lyme Regis, a picturesque town on the West Dorset border, part of the World Heritage site The Jurassic Coast, is The Royal Lion Hotel. This stunning haven is located in the middle of the main shopping quarter, less than 100 metres from the sea, and boasts a three star rating from AA, thirty-three individually decorated bedrooms, its own private car park, 45ft heated swimming pool, sauna and hot tub. Steeped in history Lyme Regis is renowned for its fascinating past, mentioned in the Domesday Book of 1086, the unique fossils found in the cliffs and beaches, and for being the central location of the novel and the 1981 film, 'The French Lieutenant's Woman'. Built in 1601 as a coaching inn, this grade II listed hotel has been extensively refurbished, yet still retains much of its history and unique charm. There are many oak beams, wood panels and an open fire which help to create a warm, welcoming and comfortable atmosphere. Set within Lyme Regis, a picturesque town on the West Dorset border, part of the World Heritage site The Jurassic Coast, is The Royal Lion Hotel. Privately owned and managed, The Royal Lion Hotel has gained an enviable reputation for its friendly service, world class food, wine and leisure offerings. From A35 take B3165 from Hunters Lodge junction, go through the village of Uplyme and follow the road into Lyme Regis. The Royal Lion Hotel is in the centre of town on the left hand side of the main street on the A3052. Local buses serving Lyme Regis are the X53 and 31 both stopping nearby.